I see people opining about how unstable Winston is, but he was far more stable than Helen's own MPs last time he was in coalition (looking at you, Taito Philip Field et al). Shane Jones is a bigger concern, although I suspect Ron Mark is up to the challenge. I think Tracey Martin is the real talent there. Knows what she's doing, works well with others. I thought that too, but the Liberals in 1911 formed government without a plurality (though it didn’t last the term). 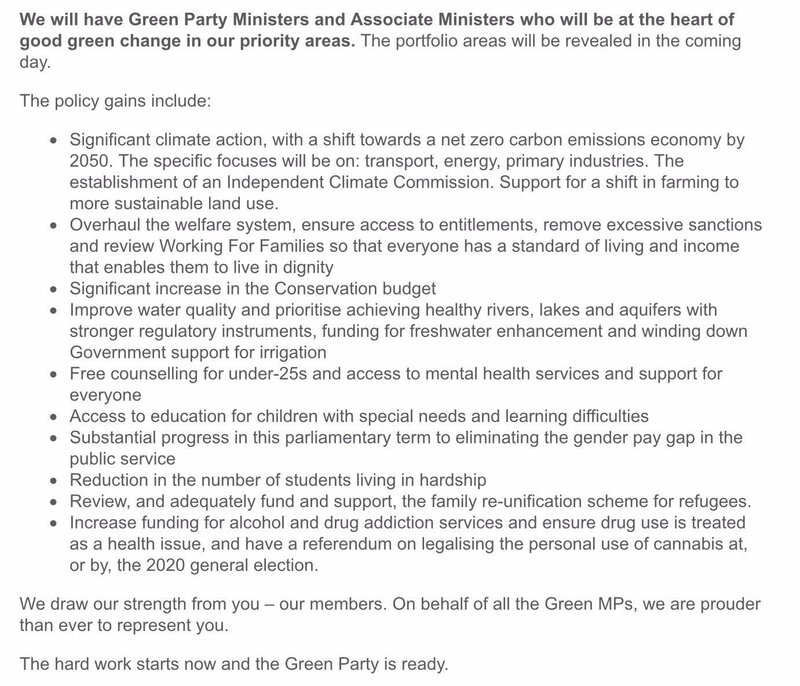 BTW, here's the email on policy gains that went to Green delegates before their teleconference last night. I wish the new government all the best, and if anyone still doubts Ardern's readiness and competence, I'd recommend watching the whole of her press conference from yesterday (thanks RNZ Checkpoint, no thanks TV1, who cut to Hosking instead). Then compare it with any press conference by the President of the USA. Only one of these people is qualified to lead a country, and it's the girly-chicky-babe, not the super-successful businessman with all that "experience". I'm not dreamy-optimistic, though. I think the government should be able to make some positive changes that last, the kind that National like to oppose and then keep. That's all I really ask for. It might seem – and indeed it is – unfair that Peters’ party will enjoy four seats in Cabinet while the more talented Green caucus gets none. I can't say that I see it that way. Yes, Cabinet positions wield significant power, but so does being a required part of a coalition. We see it in the policy concessions immediately. The Greens can collapse the government if they are left out too hard. I don't think that will happen, though, instead they get their first internship in real power. They're a party of policy much more than individuals, so I can't see this becoming all about personality clashes and so on. It's far too stable a movement, far too international. This is the beginning of a sea change long in the making. I still can't get over how happy I am about this outcome. I'd told myself for a month I didn't really care, but that was probably more to cope with the chance of Winston selling out to National, and all the prolonged misery that would entail. This is the government I voted for, at least 2/3 of the parties in power got my vote and the other is the necessity of political compromise. I had a feeling Peters would do this, that his last political throw would not be to reward National with a historically long term for doing things that are essentially the opposite of what NZF would seem to stand for. Furthermore, I think the whole NZF board being consulted thing was real, that Peters is succession planning now, and his personal views had to take a lesser place to the views of his support, the organization he built. If he has any legacy, that party is it, and it's a big part of growing up that they were empowered to make choices on their own consciences and policy. In the next few years they will show if they are a real organization, or an unstable clique of opportunists. My gut feeling is that they are real, but we shall see. I'm really optimistic that this government can work. I expect Ardern will get a second honeymoon with a poll bounce and if she sets about Labour's 100 day plan with a vengeance, that bounce will become lasting support. This here, what happened yesterday, is why we chose MMP, more than once. It's politics of consensus, it's lots of talk and a lot less arbitrary power and arrogance. Sure, the other side, the losers in this outcome, hearken back to the day when their plurality would have been outright power. But their opinion is in a minority, clearly so in an entirely other democratic process, the only one by which a single issue can be clearly selected in a plebiscite, a referendum. That powerful vestige of participatory democracy gave us the representative democracy today that truly represents the majority of voters. I feel strong hope for NZ in a way I haven't in over a decade. Kia kaha, Labour, the Greens, and NZF, welcome to government! Special congratulations to Prime Minister Elect Ardern. Shane Jones is a bigger concern, although I suspect Ron Mark is up to the challenge. I hope that top of the confidential briefing list for Labour and Green MPs will be "When the press gallery come to you with Jones' latest, do not take bait. Roll eyes, and walk away. Every government will have MPs whose self-regard vastly exceeds their ability, and he will be ours. Leave him to the PM." Martin as minister of education would be terrific. (She's the only NZFirst MP I'd pick as a minister.) Better than Hipkins (sorry Chris.) But either will be streets ahead of anyone National has appointed. Tolley was tone-deaf, insensitive and policy-wise disaster. Parata was slightly more entertaining but still all of the above. No chance Kaye would change direction. Part of David Seymour's tantrum this morning, from Newshub's liveblog. Can you actually imagine alleged "wild card" Marama Davidson losing the plot like this? As for a referendum on cannabis, I think it's appropriate. It's likely to have been a compromise made with NZF who would probably have refused it as policy. Sometimes this really is the way to make decisions like this. There's nothing like millions of people saying "I want this" at a ballot to cut through all the party wrangling and voter segmentation BS that goes with representative democracy. Sure, if it were just Labour policy it could go through a lot quicker. But this might be the more lasting way to do it. If the government changes hands again, they're far less likely to overturn something arising from a referendum than they are to simply overturn the last government's policy. Part of David Seymour’s tantrum this morning, from Newshub’s liveblog. Can you actually imagine alleged “wild card” Marama Davidson losing the plot like this? One of the most enjoyable things about the next 3 years is that it isn't going matter what Seymour thinks. To think I once voted for his party, and against MMP. But then I grew up. As for a referendum on cannabis, I think it’s appropriate. It’s likely to have been a compromise made with NZF who would probably have refused it as policy. The interesting thing is that for some time a referendum was actually NZ First policy. So it may not have been a difficult compromise to reach. But this might be the more lasting way to do it. If the government changes hands again, they’re far less likely to overturn something arising from a referendum than they are to simply overturn the last government’s policy. Seymour is a wanker. Even if Shane Jones has some prior claim in that regard. Looking at a photo of the National cabinet earlier this week I thought, "I despise almost every single one of these people." It would be hard to find a bigger collection of liars and self-interested pricks who don’t give a damn about our country. Thank God that's finally changed. And it’s great to see that the Greens’ gained a referendum on cannabis legalisation. Hopefully any future legislation will be based on the Drug Foundation’s excellent Model Drug Law proposal which takes a refreshingly common-sense approach to the issue. After years of neo-lib darkness there is actually a glimmer of hope... of a better future for all New Zealanders. Today is a good day. I was most impressed when I saw her on Back Benches recently. She 'got' climate change - and apparently v good on education. and let's see our media reflect that appropriately with a 5/1000 share of airtime. I don’t think that will happen, though, instead they get their first internship in real power. An I think that is underlined, it speaks volumes really, that the Greens have 98% backing of their 150 or so delegates to make this internship a significant one. They might be kept on after the 'summer break'! All the talk of Chinese spies in the National caucus and the way the Chinese are appointing every ex-Nat MP they can to Chinese companies, over friendly relationships with construction companies etc etc points to how important frequent elections and rotations of government are to our democracy with its relatively weak constitutional safeguards. The change of government will be a breath of fresh air against National's creeping corruption, at the very least. That is intriguing. On the one hand, it's such an obvious rejection of the hypocrisy present in our laws around alcohol, smoking, gambling, and sports (for all of which I would think NZF voters believe in their firm rights to enjoy), when it comes to personal harm. On the other, it's a hypocrisy that's gone on so long that it's polarizing. I'm curious why they have that policy. Also, glad to hear it. Martin as minister of education would be terrific. She’s certainly familiar with the area, and passionate enough, and when talking to her about it she generally sounds good. However, she was Chair of the Mahurangi College Board of Trustees for many years, and that’s not a school that many people would be willing to hold up as an example of where our education system should be heading. If she was unable to use that governance role to get success there, that doesn’t bode well for a far larger role. Whither the pensioners? Winston rode to notoriety on a walking frame yet there's been very little talk about them in discussions. I’m curious why they have that policy. Maybe because various Grey Power groups have been asking for a change in policy, especially for medical cannabis. Change is afoot. Yes, I can't look at the bible-length Australian constitution with much envy, considering the politicians they seem to elect, and the endemic graft and corruption that is normalized there. Let alone the USA's constitutional safeguards that have normalized mass murder as an unremarkable occurrence, and placed a man-child Twitter troll in charge of their nuclear arsenal. This here, what happened yesterday, is why we chose MMP, more than once. It’s politics of consensus, it’s lots of talk and a lot less arbitrary power and arrogance. Someone asked about Winston and the Bolger government. That didn’t collapse till Shipley took power in a coup. Apparently she had been undermining Peters previously and that is what happened. People don’t remember the full context. I am not a fan of Peters but he has been around since the 70’s and he clearly has some skills in the back room. I’m happy the Greens have a seat at the table this time even if it is slightly removed. That is just the way the votes came out. If the Greens had 9 seats the NZF had 8 I doubt a deal could have been done so this is great. Bill English has made history it being the second time he has inherited a prime ministership only to lose it all. We need some vision and leadership and going with a new government is much smarter than retreading the same old team for a fourth term. I’m hoping National might even be a half way decent opposition. There are plenty of ( now ex) cabinet ministers that needed to wake up. The Greens leader just said "it's time to move to a regulated market". That's not good, if it's anything like the current alcohol market, with its promotional marketing practices. Cannabis has a high dependency rate, and it fucks some people totally up.